It is time to get your LibGuides site in shape! 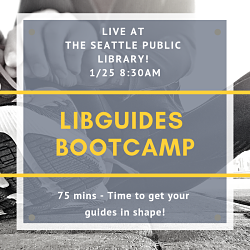 Get ready to get down and dirty as we take apart LibGuides and see how to build better, more organized, and more visually appealing guides. You will need to be a System Admin to access all of the tools we will be covering in the session. A basic understanding of CSS and HTML is recommended. While this session will cover LibGuides CMS only features, you do not need to have LibGuides CMS to attend (but after you leave you might want to upgrade). The session is for all libraries, Public, Academic, School Libraries and more! This event is held at the Seattle Public Library in the Washington Mutual Foundation Meeting Room on Level 4. You do not need to be registered for ALA MidWinter to attend this event. The event is open to all current Springshare Clients. Space is limited so please be sure you can attend prior to registering.